What we refer to as "traditional" in the martial arts often isn't traditional at all. Mention traditional karate today and people immediately think of white gis, coloured belts and marching up and down the hall in lines. All of which are modern practises and none of which would be recognisable to founders of the art. All of the past masters were innovators and none of them went on to teach the art exactly as it was taught to them. The true tradition has been one of constant change and it was only ever the core concepts that were supposed to remain constant. So what were the core concepts upon which the traditional art of karate was based? There are not many written records on the history of karate due in no small part to the secrecy that originally surrounded the art and the bombing of Okinawa during World War Two. One important document we do have access to is Anko Itosu's 10 precepts of karate. Anko Itosu (1832-1915) was one of karate's true innovators; he was the creator of the Pinan (Heian) kata and was responsible for introducing karate onto the Okinawan school system. To make karate suitable for children, Itosu watered down the karate he taught to them. As part of this, he started teaching kata without their applications so that the children could gain the physical benefits of kata training without irresponsibly giving them knowledge of the violent and brutal methods the kata were created to record. It is my view that Itosu intend to foster two types of karate: the original combative karate and the new children's version. However, as we now know, it was the children's version that really took off and the ramifications of that are still being felt today. Itosu's modifications enabled the art to spread - it is arguable that karate would never have spread to mainland Japan and from there to the west without his modifications - but they undoubtedly meant it was a "de-clawed" version of karate that was popularised. 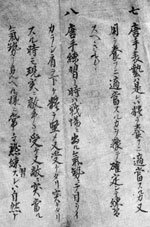 In 1908, Itosu wrote a letter outlining his views on karate and explaining why he felt karate should be introduced on to the Okinawan school system. It is this letter, and the 10 precepts recorded within it, that is the subject of this article. This letter gives us an insight into karate as it was coming out of the shadows and beginning its journey to becoming an art practised by millions. There are a few English translations of this important document; but unfortunately they vary greatly and it is difficult to determine which ones are correct. You would expect some variation when moving text from one language to another; however, some of these variations are not just different ways of saying the same things, as would be expected, but they often express very different sentiments. Most of these translations are also done by martial artists. I therefore can't escape the suspicion that they may be inadvertently putting their own views on karate into their translations. There is a rare 1938 book complied by Genwa Nakasone called "Karate-Do Taikan". This important book contains material by masters such as Funakoshi, Mabuni and Otsuka. It also contains relatively good quality photographs of Itosu's 1908 letter. I sourced a copy of the book from Okinawa and sent scans of Itosu's letter - without any background information - to one of the UK 's leading translation companies. As non-karateka and professional translators I felt that they would be able to give an accurate and "un-skewed" translation. The translation company informed me that the document was written in "a very old literary style" and hence was difficult to translate; even for professional translators. This may also help explain why the existing translations of the document vary so much? The translation company contacted a specialist based in the USA who would be able to accurately translate the document and the scans were sent to him. It is this translation that is included in this article. The translation was taken from scans of Itosu's original handwritten letter. This translation was also done independently by a leading professional translator who is a specialist in this kind of work. The translator was not a martial artist and he therefore had no specific view to promote. I therefore have no reason to doubt its accuracy. That is not to say other translations are necessarily inaccurate - it is certainly similar to others; as you would expect - however, there is no denying that in parts the one I commissioned expresses very different sentiments to some other translations. I would encourage the reader to compare the existing translations and decide for themselves which make most sense and are likely to be the most accurate. Karate did not develop from Buddhism or Confucianism. In the past the Shorin-ryu school and the Shorei-ryu school were brought to Okinawa from China . Both of these schools have strong points and I therefore list them below just as they are without embellishment. 1. Karate is not merely practiced for your own benefit; it can be used to protect one's family or master. It is not intended to be used against a single assailant but instead as a way of avoiding injury by using the hands and feet should one by any chance be confronted by a villain or ruffian. 2. The purpose of karate is to make the muscles and bones hard as rock and to use the hands and legs as spears. If children were to begin training naturally in military prowess while in elementary school, then they would be well suited for military service. Remember the words attributed to the Duke of Wellington after he defeated Napoleon, "Today's battle was won on the playing fields of our schools". 3. Karate cannot be quickly learned. Like a slow moving bull, it eventually travels a thousand leagues. If one trains diligently for one or two hours every day, then in three or four years one will see a change in physique. Those who train in this fashion will discover the deeper principles of karate. 4. In karate, training of the hands and feet are important, so you should train thoroughly with a sheaf of straw (#). In order to do this, drop your shoulders, open your lungs, muster your strength, grip the floor with your feet, and concentrate your energy into your lower abdomen. Practice using each arm one to two hundred times each day. 5. When you practice the stances of karate, be sure to keep your back straight, lower your shoulders, put strength in your legs, stand firmly, and drop your energy into your lower abdomen. 6. Practice each of the techniques of karate repeatedly. Learn the explanations of every technique well, and decide when and in what manner to apply them when needed. Enter, counter, withdraw is the rule for torite. 7. You must decide if karate is for your health or to aid your duty. 8. When you train, do so as if on the battlefield. Your eyes should glare, shoulders drop, and body harden. You should always train with intensity and spirit as if actually facing the enemy, and in this way you will naturally be ready. 9. If you use up your strength to excess in karate training, this will cause you to lose the energy in your lower abdomen and will be harmful to your body. Your face and eyes will turn red. Be careful to control your training. 10. In the past, many masters of karate have enjoyed long lives. Karate aids in developing the bones and muscles. It helps the digestion as well as the circulation. If karate should be introduced, beginning in the elementary schools, then we will produce many men each capable of defeating ten assailants. (#) - Translator was not a martial artist and hence translated the word "Makiwara" to "Sheaf of Straw" when leaving the word un-translated would have been fine. This is obviously a very important document and I will leave it up to the reader to ponder the significance of each of these precepts for themselves. However, I would like to briefly discuss some points of initial interest. The first thing that strikes me is that the karate Itosu was proposing for Okinawan schools, watered down though it was, was obviously not intended to be wholly un-combative. Certainly he seems to be selling the art not only on its health benefits, but also on its combative use and its ability to produce effective fighting men. It was perhaps Itosu's original intention that the children would eventually be able to move on to learn the true art when they reached adulthood - which would then presumably include instruction in the application of kata, makiwara work etc. - after receiving a grounding in the children's version of the system. Therefore, in Itosu's words, karate would produce "many men each capable of defeating 10 assailants". Certainly Precept 10 would suggest that. Sadly Itosu's changes had unforeseen consequences and kata is now most commonly taught without any applications. I also find it very interesting that the opening line ("Karate did not develop from Buddhism or Confucianism ") makes it clear that karate is not based on Buddhist or Confucian principles. Itosu obviously felt it important to establish right from the off that the art he practised was not an offshoot of these religions / philosophies. This is important as some mistakenly view the art entirely from Buddhist and Confucian perspectives. Followers of other religions are also sometimes put off studying karate as they believe it is based on religious practises that run contrary to their own beliefs. Itosu tells us this is not the case and that karate has no religious foundation. Precept 1 contains the line " [karate] is not intended to be used against a single assailant but instead as a way of avoiding injury by using the hands and feet should one by any chance be confronted by a villain or ruffian." This makes it clear that the original karate was not for a "square go" or consensual fight against a single opponent or fellow karateka, but instead for civilian self-protection. As a modern day martial artist I think it is important (and fun) to train for both environments, but it is essential to understand that a "square go" and self-protection do not utilise the same methods. What works well in one area won't necessarily work well in the other. Itosu obviously understood the difference between the two as he marks the difference in his first precept. As examples of these differences: closing the gap, skilled footwork, guards, feints, and varied combinations are commonplace in a consensual fight but are irrelevant for civilian self-protection; which is why such methods do not appear in kata. When studying kata - which is a record of the original art Itosu is describing - we need to ensure that we understand that kata was created to record methods for civilian self-protection. It is when people view kata from a "square go" perspective that they misunderstand its nature and hence come to incorrect conclusions about how they should be applied. A common example of this is when karateka do competitive "bunkai demonstrations" that begin with the antagonists at sparring range (i.e. 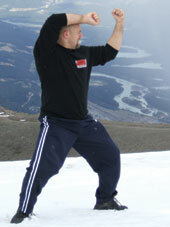 outside kicking distance) as opposed to the extremely close range associated with live combat. In doing this they are trying to force a square peg into a round hole and hence it is no surprise the kata is frequently deviated from during such demonstrations. Itosu was employed as a scribe by the Okinawan king and was highly educated in the Chinese classics. After the dissolution of the Okinawan monarchy, Itosu became a school teacher. The highly educated Itosu also reveals a knowledge of western culture by attributing words to the Duke of Wellington in Precept 2. As an aside, it is also interesting that Itosu says the words are "attributed" to the Duke of Wellington. The quote "Today's battle was won on the playing fields of Eton" is certainly widely attributed to Wellington; but he did not say those words. It was actually a number of years after Wellington's death that the French historian and propagandist, Count de Montalembert first attributed those words to him. Did Itosu know that? Or was the choice of characters which translate as "attributed to" as opposed to "said by" merely coincidence? If not coincidence, then it may suggest Itosu was extremely well educated about western military history. Precept 4 strongly encourages the thorough use of impact equipment. In Itosu's time, the makiwara was all they had available. However, if he were around today I'm sure he would have also made use of punch bags, focus mitts, kick shields etc. It is not uncommon for today's karateka to neglect impact training, but as we can see from Itosu's writing this is not traditional nor is it inline with the original practises of karate. 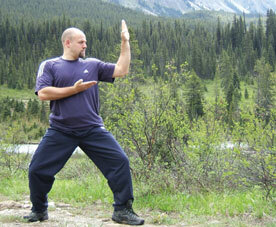 Precept 6 encourages us to study the bunkai, or applications of kata, (i.e. "Learn the explanations of every technique well") and to personally explore the appropriate use of such bunkai in combat. Many karateka do not include bunkai in their training and hence are not training in accordance with this principle. Itosu also makes it clear that we must also decide when and how the techniques of karate should be applied. Even people who study bunkai often fail in this regard. Knowing what a kata motion is for and knowing when and how to effectively apply it are two very different things. To my mind, the only thing that can truly help us to decide how techniques should be applied is to practice applying them in a live environment. It is for this reason that kata-based-sparring is fundamental to my four stage approach to kata as it ensures the theory of kata is put into practise (see the free e-book that can be downloaded from this site). The final sentence of the 6th precept ("Enter, counter, withdraw is the rule for torite") is another I find very interesting. "Torite" refers to grappling (literally "seizing hands") and is used in karate circles to refer to the grappling side of the original art. "Torite" was also an old term for Ju-Jutsu and was used in that way in some of Jigaro Kano's writing (Kano being the founder of Judo). Itosu's "enter, counter, withdraw" rule would seem to be anti-grappling advice i.e. when grabbed you can't immediately flee the scene, so get in there, do damage, and then get out of there. This is sound advice for civilian self-protection and is totally in accordance with the nature of karate as explained in Precept 1. Precept 7 advises you to decide if your karate is for health or " to aid your duty " (i.e. its practical use). Precepts 2, 3, 9 and 10 make reference to the physical benefits of karate. Precepts 1, 2, 6, 8 and 10 all make reference to karate's combative use. I therefore don't think that Itosu is saying that karate training has to be entirely for one or the other, rather that we should be clear as to our training objectives. I also feel he is marking the difference between the children's health orientated version of karate and the original combative art. Precept 8 advises us to train in an intense and spirited way such that we will be prepared for the severe and unforgiving nature of combat. This intensity in training is one of the keys to the true tradition of karate. Indeed, this mental and physical intensity is more important than technique. In the book "Karate-do: My Way of Life", Gichin Funakoshi, who was a student of Itosu, wrote, "Train with both heart and soul without worrying about theory. Very often a man who lacks that essential quality of deadly seriousness will take refuge in theory." We can see this "taking refuge in theory" and lack of intensity in some of today's "traditional" training. To follow the true tradition, we would do well to adhere to Precept 8. Itosu's 10 precepts is unquestionably one of the most important historical documents on karate. To understand kata, and the true nature of traditional karate, it is important that we study the words and guidance of the people who formed the art. I hope that you have found this translation of Itosu's 10 precepts interesting and that you will, as Itosu advises, "seriously consider" what he has written.